Texas native, Christen Schritter is a passionate yoga teacher and mother of three wildthings! After years of struggling with anxiety, Christen immersed herself into yoga in 2010. Her passion for yoga has grown throughout the years incompassing several teacher trainings and workshops. 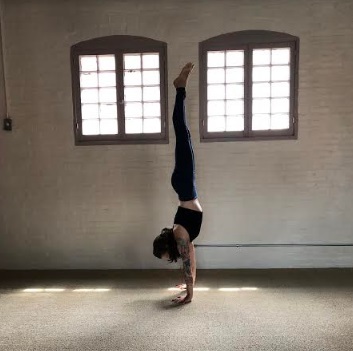 She currently shares her passion as a yoga teacher in the Baltimore area. Christen’s teaches from a place of compassion, integrating yoga philosophy and mediation into the asana practice. When she’s not doing yoga, she enjoys riding bikes, cooking, gardening and knitting. I’m a fantastic cook! I’ve been in the kitchen since I could stand up, learning from my grandma. She taught me everything she knew and I’ve been building on those skills for a decade now. I nurture people I care about by cooking for them. It’s my way of sharing love. My kids. They’re watching me all the time, counting on me to be a good person. a. To travel the world, try new things, and live life to the fullest! b. To become a traveling yoga teacher. I feel too young to answer this question. So far, I feel pretty accomplished to create and sustain 3 little lives. My kids are incredible and I’m very proud of who they are individually. Getting on a plane to meet my dad for the first time at 32. This was a time of soul searching and self discovery for me. As a person who put up walls with people for a long time, it was good (and really scary) to be vulnerable and open. I learned a lot about myself through that experience and I’m a completely different person because of it. It isn’t over yet. I remind myself of this daily. Whatever we are dealing with, it is just one step in the path. The outcome is still to be determined. It’s okay to make mistakes, it’s okay to change your mind, to course correct. Don’t stress…it’s going to be okay because it isn’t over yet. I’m inspired by the wild woman. I’m inspired by her raw feminine power, intuition, and connection with the earth and all of it’s inhabitants. She lives in the heart of all women. The universe has led me to Maui (Hawaii) so many times. It’s not just a destination to me, but a place where I have connected with family. Anything that allows me to keep moving and having fun: toe shoes, yoga mat, bike, yoga trapeze… I’m sure the list will keep growing. I love new experiences! I feel like I’m always learning something new. Recently I started learning how to use a yoga trapeze and it’s a blast!